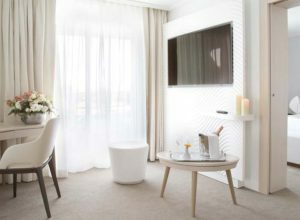 The Fil de l’Eau Prestige Suite is situated at the very prow of the building and enjoys a view of the marine lagoon and ocean horizon. 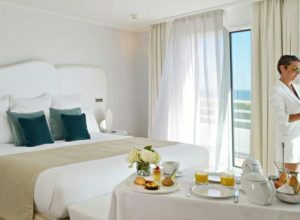 The Miramar La Cigale Prestige Suite offers 80 sqm decorated in a modern and elegant style and enjoys a view of the ocean horizon and marine lagoon. It also features a dressing room, bathroom, Jacuzzi, separate toilets. 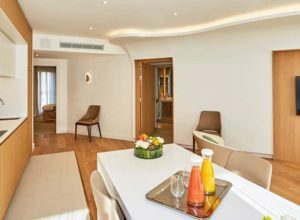 The Fil de l’Eau Prestige suite includes a bedroom with 200×200 king-size bed (can be separated), a dining area, lounge with settee, dressing room, Jacuzzi, bathroom with bath and shower as well as a private terrace with sun loungers. Decorated in a refined style, our Fil de l’Eau Prestige Suite has two bathrooms, one with an Italian style shower and a bath tub, and the other with a whirlpool bath. The ideal choice to enjoy an unforgettable stay at the entrance to the Gulf of Morbihan. The Fil de l’Eau Prestige Suite can accommodate two extra beds for children (free for children up to 12 years old). Richly equipped and full of charm with its fabulous materials, the Prestige Suite Fil de l'Eau immerses you in a universe combining cocooning and oceanic atmosphere. Indulge in a wellbeing experience close to the ocean. Select the room that corresponds to your needs and expectations. Destination southern Brittany for a unique Thalasso stay. Under the sign of relaxation and wellbeing come and relax in a marine environment close to the sea. Immerse yourself in the fabulous setting and experience the magic of Miramar La Cigale. Treat your palate to a feast at our restaurants Le Safran or Le BE. 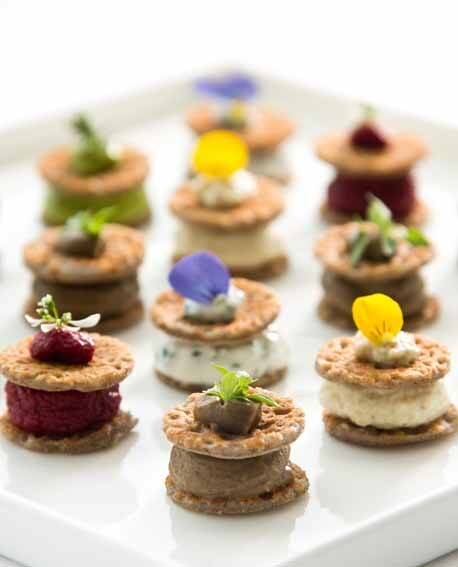 Discover delicious gastronomic dishes created by Chefs Xavier Jégoux and Marion Bouillot. Here, taste rhymes with refinement and gourmet pleasure in a modern décor with a view of the Ocean.